We attended the Feline All Breed Cat Club Show today. Definitely a day for the boys! In Ring 1 Gr Ch Shwayamore Petite Riley was Reserve Group 3 Exhibit with Gr Ch Riordan Urban Myth as 3rd Best. Riley went one better in Ring 2 where he was Best Exhibit Group 3 and then went on to Supreme Exhibit. Well done Riley! Our first show for over a month today when we exhibited at the Sunset Coast Cat Club. Another successful day! Gr Ch Riordan Urban Myth was Best Foreign Shorthair Exhibit under visiting US judge Carla Bizzell with Gr Ch Shwayamore Petite Riley as her Reserve Best Foreign Exhibit! 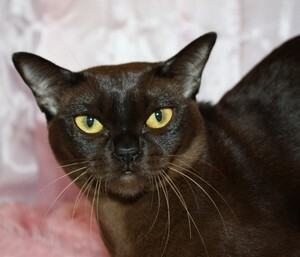 Meanwhile in Ring 2 local breed specialist Jenny Casotti chose our young Chocolate girl Shambo Original Sin as her Reserve Best Foreign Exhibit and Best Burmese. Another fantastic day at the Burmese and Others All Breed Show today. Shambo Original Sin was Best Kitten in Show under visiting judge, and breed specialist, Carolyn Davis. Sindy then went on to win Supreme Exhibit! Our gang won too many individual places to list here but I must mention that Riley and Urban Myth now have their Grand Champion titles and the lilac girl, Riordan Paper Moon, is now a Champion. One show but three new champions! 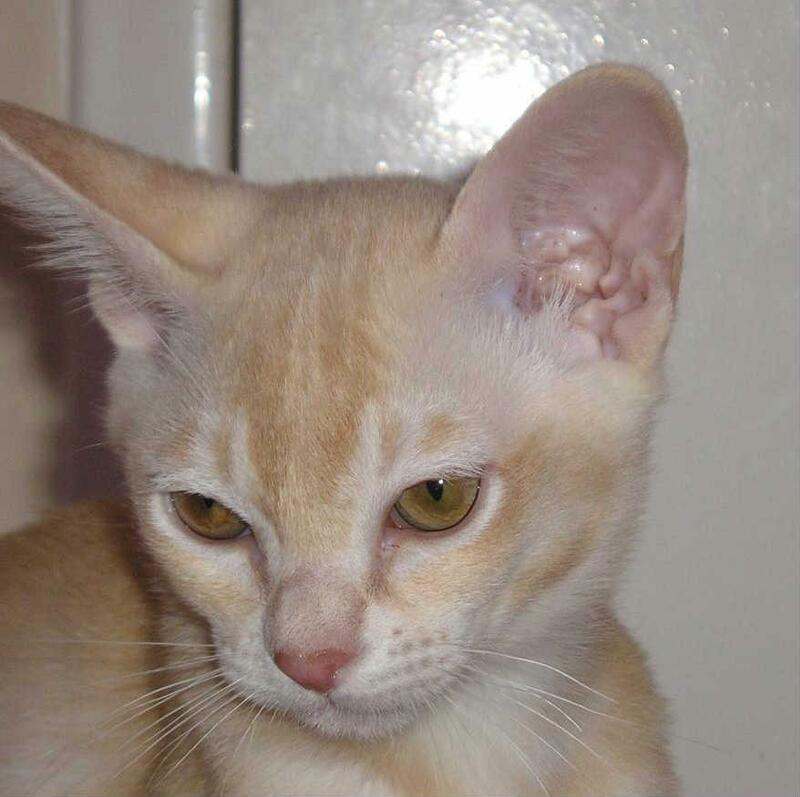 Today at the Oriental Shorthair Cat Club Show Petite Riley, Urban Myth and Dakota all gained their titles. 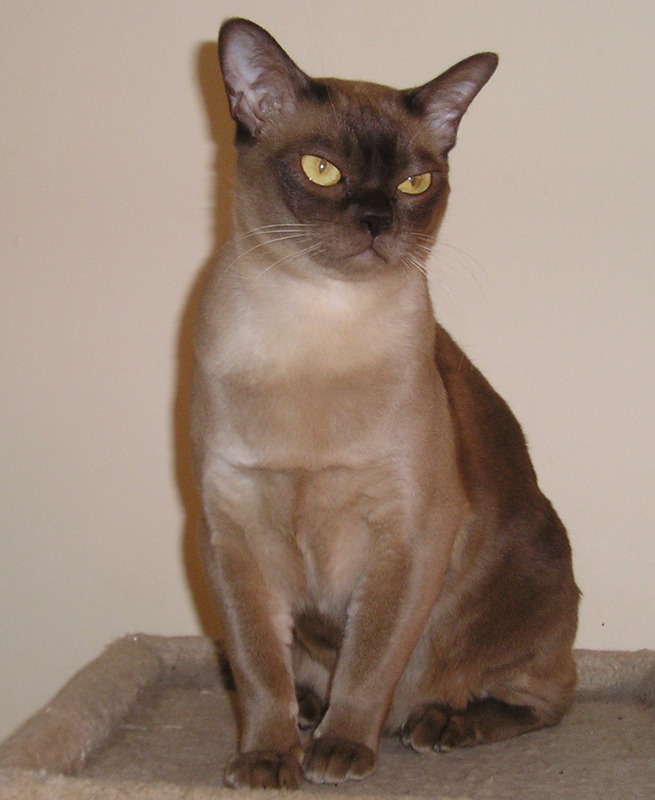 Once again our cats were awarded Best Burmese in all three rings, Riley in two and Urban Myth in the third. Riley was also Best Exhibit - Group 3. A great day today at the Joint Burmese and Other Breeds / Sunset Coast Cat Club Annual Kitten Show. 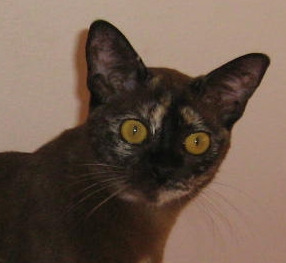 Our beautiful Brown girl Shambo Dakota was Supreme Exhibit and our new Chocolate kitten Shambo Original Sin was Supreme Kitten. Congratulations to their breeder Martyn Fleming! Picture of these two lovely girls will follow when they stay still long enough to have them taken! The Birman, Rex and Others Cat Club started off the show year here in Perth today. Shwayamore Petite Riley was Best Burmese and Reserve Best Group 3 Exhibit in both rings at just over 9 months. Gr Ch Riordan Venus Rising, Riordan Urban Myth and Shambo Dakota also gained Group placings. is COAWA's Cat of the Year (All Breeds) for 2009!! Way to go Venus!! 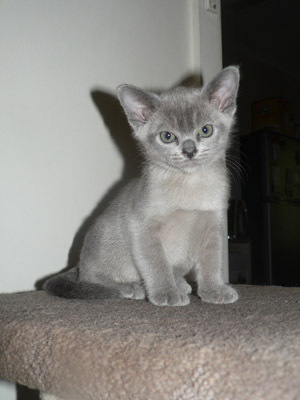 This is Riordan Wicked Whispers, pictured at 7 weeks. She is a daughter of Tri Dia Gr Ch Kimlai Jumeirah out of the lilac tortie Riordan Eye Candy and is the sixth generation down from our foundation queen Ch Bambino Bluribbons. We think she's looking very promising! A wonderful day for COAWA! Contact us to find out why! Gr Ch Riordan Venus Rising finished the year in style at COAWA's Halloween Fundraiser by winning Best Group 3 Exhibit in Ring 2 and going on to win Overall Supreme Exhibit! 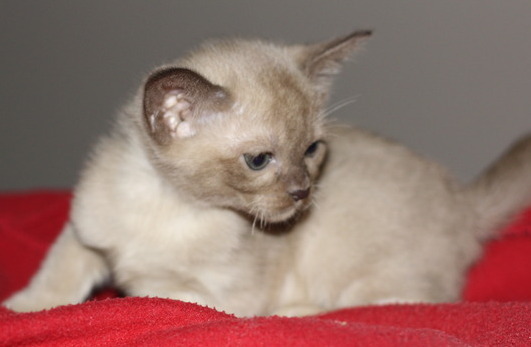 Our new Brown girl Shambo Dakota was Best Group 3 Kitten with Riordan Urban Myth 3rd Best. In Ring 2, Shwayamore Petite Riley was Reserve Best Group 3 Kitten. Making her adult debut at this show was our young lilac girl Riordan Paper Moon who was 3rd Best Group 3 Exhibit in both rings. At Perth Royal Show Gr Ch Riordan Venus Rising was Best Burmese Exhibit and Reserve Entire Exhibit (All Breeds) in Ring 2. In Ring 1 our new Blue boy Shwayamore Petite Riley was Best Burmese Kitten and 4th Best Kitten in Show - not bad for his first time out! 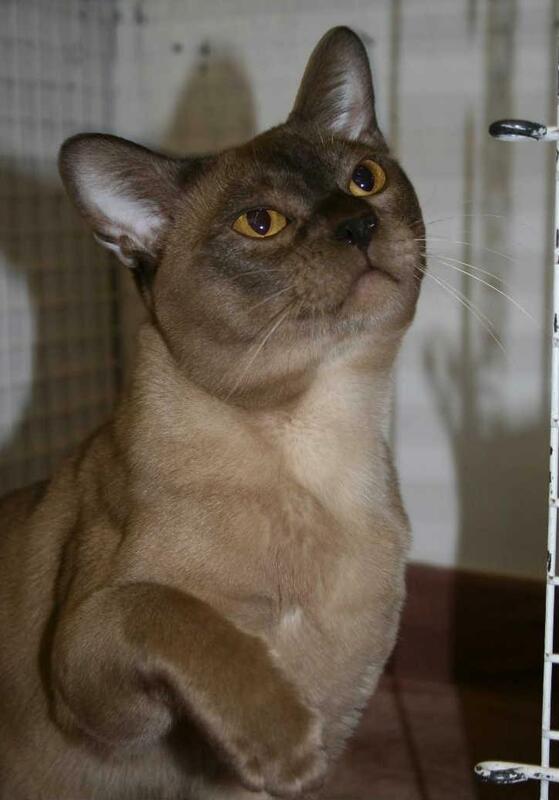 Also due for a mention is Riordan Urban Myth, our young chocolate male, who was Best Burmese Kitten in Ring 2 and placed in the finals. Connor is very similarly bred to Venus and is one of our hopefuls for 2010.. This weekend the CCCA National Show was held in Perth for the first time. Some stunning cats, from all across the country, attended and we were thrilled to have a number of our boys and girls placed in the finals. We were particularly proud of our stunning Brown Tortie girl Dbl Bronze Gr Ch Kandid Sugar n Spice who was Reserve Group 3 Exhibit under US judge Donna Fuller. Another successful show day at the Sunset Coast Cat Club. In Ring 1 Dbl Gr Ch Kimlai Jumeirah was Reserve Best Foreign Shorthaired Exhibit beating his daughter Gr Ch Riordan Venus Rising into third place. Venus turned the tables in Ring 2 where she was Best Foreign Shorthaired Exhibit with Beau gaining third place. At the Chinchilla and Shaded Cat Fanciers Show today US judge Jan Rogers made Ch Riordan Venus Rising her 4th Best Exhibit in Show (with over 120 entries). Venus also gained the final certificates towards her Grand Champion title. Ch Riordan Venus Rising was Reserve Best Other Foreign Shorthair Ring 1 and 4th Best Other Foreign Shorthair Ring 2 in a large entry of quality cats. At the Siamese Cat Club of WA's show today our new star Riordan Venus Rising was Best Group 3 Exhibit in Ring 1 (beating her father Beau into 3rd place!). She then went on to win 3rd Best Group 3 Exhibit in Ring 2 and also gained her title on the day, at just 11 months. We are particularly proud of Venus as she represents the 5th generation of our breeding, on her mother's side, tracing back to our foundation queen the lovely Ch Bambino Bluribbons. Double Gr Ch Kimlai Jumeirah was Best Burmese and 3rd Best Entire in Show. At the Burmese Cat Club of WA six ring show held over the weekend Beau was Best of Breed Burmese and Best Group 3 Entire under judge Margo't Maddicks. He is now Double Gr Ch Kimlai Jumeirah. Junior also had a good weekend and gained a new title too! He is now Ruby Gr Ch Rossikhan Jackthelad. Riordan Gelato left us today to begin the long journey to his new home in Hawaii. Good luck Charlie! Diamond Gr Ch Kimlai Jumeirah was Overall Best Burmese and Reserve Group 3 Entire. Ch Molynmeux Contradiction - both UK imports. Finally, after a seven month nightmare with Optiic / Breedsite we have control of our website back. In future we intend to ensure that this site is regularly and reliably updated. Please keep checking back for updates as we have some very exciting things planned for 2009! © This website is owned and maintained by Riordan Burmese. All content and images remain the property of Riordan Burmese and may not be reproduced under any circumstances.